This expanded metal security truck protects valuables from damage and theft during transport. 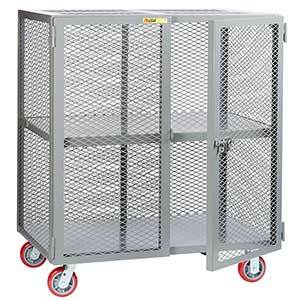 Constructed of heavy gauge steel mesh with welded angle frame, it can move loads up to 2,000 lbs. 3/4" x 1-3/4" mesh openings provide visibility yet are small enough to deter pilferage. Double doors swing 270° outward for complete access and close tight with a lockable slide latch (padlock not included). Shelf D x W: 24" x 48"